ALEXANDRIA, Va., July 5, 2011 - Most recreational boats in the US are "trailer" boats. Stored in the backyard or driveway, they are trailered to the water and enjoyed for the day. They are also refueled at your local gas station or minimart, which may soon offer a fuel, E15 (or 15% ethanol), that is prohibited by the federal government for use in boat motors and violates engine manufacturer warranties. That has the nation's largest recreational boat owners group, BoatUS, concerned over the potential for accidental misfueling. 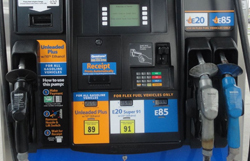 Last week's EPA's debut of it's proposed solution - a small, orange label affixed to the gas pump titled "Attention" - has only heightened the need for boaters to be vigilant, said the Alexandria, Virginia based association. "As this new fuel starts appearing at the local fuel pump, we see the real likelihood of putting the wrong fuel in your boat," said BoatUS Vice President of Government Affairs Margaret Podlich. "It could lead to costly engine or fuel system damage, and potentially leave you stranded out on the water with a disabled vessel, compromising your family's safety. When a boat's engine stops running, you can't pull over to the side of the road," added Podlich. Earlier this year, the EPA authorized the use of E15 in 2001 model year and newer motor vehicles. However, the agency did not authorize its use in marine engines or a range of off-road vehicles, tools and equipment. Currently, most boaters in the US have transitioned to E10 (10% ethanol), the maximum percentage of ethanol permitted in gasoline before most engine manufacturer warranties are voided. However, many boaters still go out of their way to find ethanol-free fuel. BoatUS believes it will be hard for consumers to recognize when or where E-15 is being rolled out to their local gas stations or fuel sellers. "Most likely consumers will encounter E-15 for the first time at their local gas station with little or no fanfare, and may be attracted to its price. This means we have to be alert now - it's really a situation of buyer beware," said Podlich. The boater's group also said the issue goes far beyond gas-powered boat engines. "I encourage anyone fueling - whether it's for your boat, car, motorcycle, generator or six-gallon portable tank for your lawnmower or leaf-blower, to absolutely know what type of gas is going into that tank," said Podlich. "Unless you have a 2001 or new motor vehicle, the gasoline-powered engines you own were not built for E15. Now is the time to start knowing which gas stations offer you safe fuel." About BoatUS: BoatUS - Boat Owners Association of The United States - is the nation's leading advocate for recreational boaters providing over half a million members with government representation, programs and money-saving services. For membership information visit www.BoatUS.com or call 800-395-2628.